gallery – Just Stop and Paint It! I traditionally make a visit to the Monterey, Carmel, and Big Sur area about a week before the Carmel Art Festival, to get fresh ideas for the competition. The Carmel Art Festival is like many plein air events in that the artist has a few days to complete a number of paintings, and then the works are shown and auctioned. I generally like to have an idea of what I may paint. Although very familiar with about every nook and cranny from Santa Cruz to Big Sur, am always looking for fresh ideas. Took off today, and I mainly wanted to explore the Elkhorn Slough area (which I have painted a number of times before), and then move down the coast to the Big Sur area. I went via the “back way” to Elkhorn, and ended up doing a small painting of one of the tributary areas. I had great company, a flock of Great Egrets were close by. What a magnificent bird!! I then drove down to Carmel and visited the new gallery showing my work, Gallerie Julianne. I had dropped some works off several months ago when they were just getting going, and now, they are in full swing. Dave, the owner, manages a beautiful space, one of the best in Carmel, in my opinion. The late afternoon sun urged me back to Elkhorn to see how the light looked, and the Great Egrets were in the same lagoon to welcome me back. Several weeks ago I received an email from a new opening gallery in Carmel, CA, wanting to show my work. I had been showing in Carmel up until a year or so ago, but that gallery became a victim of the poor economy. To make a long story short, I drove the 90 minutes to Carmel today and dropped off about a dozen paintings. The new gallery, Galerie Julianne, is still in the process of ramping up, but they are open & the gallery looks like a wonderful space in an ideal location. Carmel does not have street addresses, so, you can find them on Dolores Street between 6th and Ocean. After finalizing everything with the gallery, I took off down the coast to paint and enjoy Big Sur. Below are a few shots from the day. I decided to just drive, hike, explore, snooze, and generally hang out until sunset. It was worth the wait. There are a few more photos on flickr, which you can find here. Continued work yesterday and today. I put in the rest of the valley floor, with the lower right very roughly painted as much of it will be covered with foreground trees. I continued to work on the foreground, and also all over the painting, making minor adjustments, adding some scattered clouds and other details. Normally I can do 90% of a painting this size in 3-4 days, then let it sit and occasionally make adjustments here and there over several weeks . It is also good to put it aside for awhile and then look at it with fresh eyes. This phase will start in the next day or so. Below are two shots, one of the entire painting, and one closeup of part of the sky which shows some of the color better. James Harold Gallery in Tahoe City, CA, invited me to paint in their gallery this weekend and to show new paintings. They have been carrying my work for many years and I usually do some kind of summer show. 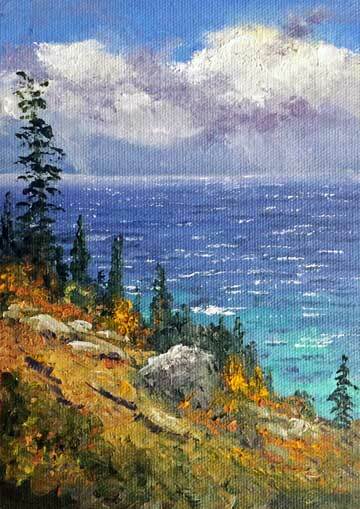 I decided to go up to Lake Tahoe on the prior Thursday, drop of some paintings, then paint in the area on Friday. My wife wanted to go and when I checked motels, found out Reno (about an hour away) was at least half the cost of staying at Lake Tahoe. My wife’s brother was planning on going to Reno that weekend, so we all booked rooms at the El Dorado. Roger, a family friend decided to join us. 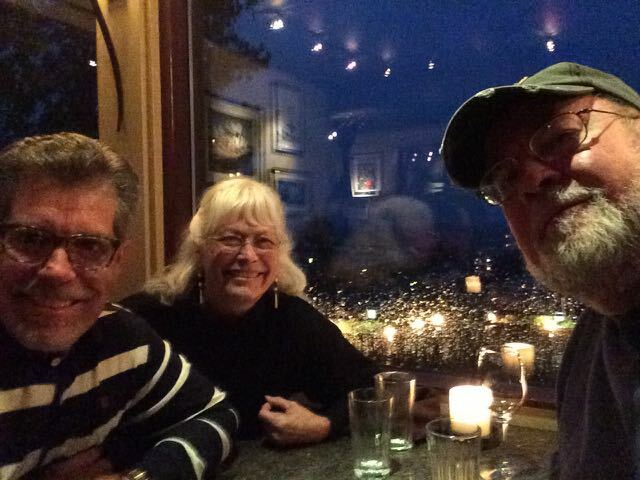 After dropping several new paintings at the gallery, we all met in Reno. That evening we had a great birthday dinner for my sister-in-law at Roxy’s right in the hotel. Friday, I drove to Virginia City which is only about a 45 minute drive from our hotel. I had painted here last year, but didn’t finish it. Virginia City is the site of the famous Comstock Lode, at one time, one of the richest mines in the world. For a time, it was also the home to Mark Twain who worked for the local newspaper. If you are ever in the area, it is a wonderful place to visit as the historic old buildings have been restored. It was so dry and hot, the oil paints, which usually stay wet for days, were drying right on my palette! The painting didn’t turn out great, but I am learning. Saturday, I painted in the gallery all afternoon. Rather than paint something from scratch, I brought a larger studio painting I was almost done with and finished it. The painting actually started out as an acrylic painting from years ago and was only half complete. After sanding it down and re-prepping it, I recently painted completely over the acrylic in oils, and then finished the rest in the gallery. The scene is from a hike I did years ago down Four Mile Trail in Yosemite Park. The trail starts at Glacier Point and steeply winds down into Yosemite Valley. The views all the way down are spectacular, and is a ‘must do’ if you ever get the chance. Here’s a picture of Your’s Truly with some of my work on display. That evening, we enjoyed the “Le Grand Cirque” show at the El Dorado. Sunday, I headed back to the gallery, and painted an 11×14 from scratch. Since fall was coming, I did a fall color scene from the Eastern Sierras, around the Virginia Lake area. My iPad came in handy as I could flip through hundreds of photo studies until I found one both me and the gallery owners liked. After the demo, it was a long drive home, arriving late Sunday night. Just returned from 4 days at Lake Tahoe. James Harold Gallery kicked off a solo show which will last most of the summer. The theme for this show is gallery wrap paintings. Gallery wrap means the canvas wraps around the support frame and has a 1 inch side. This side is painted so a frame is not required. I did a number of miniatures, diptychs, and one large painting for the show. I won’t go into a blow by blow of my trip, but will include just a few snapshots below. The best news is as I arrived Sunday, a collector was already purchasing one of my paintings! After an easy morning & one last visit to the gallery, I headed home this afternoon. During my visit to Carmel today, the bad economy was certainly showing. It seemed every block had at least one or two empty spaces with “For Lease” signs. Thirty year old businesses had shut down. Those I talked to, however said business has been picking up the last month or so. Let’s hope that trend continues! Just received word the Nomadas Del Arte show at the Southwest Gallery in Dallas Texas has been extended until mid May. I have two paintings in the show, one of which is shown below. If you live in the Dallas/Fort Worth area, it is not too late to see the show! You can view works online in the show here.